Shrimp is high in Zinc. Zinc boosts male fertility. Eat Shrimp. 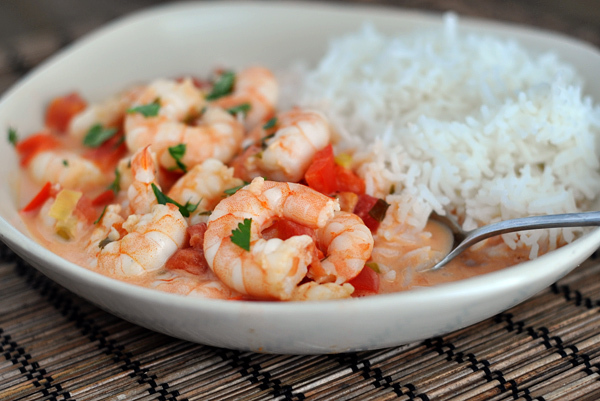 Specifically, eat this garlic shrimp in coconut lime tomato sauce. The combination of light and creamy coconut milk with tomatoes, garlic, a hint of lime and cilantro…well, it’s phenomenal. Light and fresh and fantastic. The sauce is definitely on the saucy side of things so serving this in shallow bowls so the beautiful, warm rice can soak up the wonderful sauciness is a really good idea. Consider yourself warned. Did we mention it’s super speedy? That’s the great thing about shrimp; you can usually count on it being a pretty quick meal to throw together and I’m sure you never, ever complain about that. In a medium saucepan, heat the olive oil on medium and add the red peppers, cooking until crisp-tender, about 2-3 minutes. Add the sliced green onions, both white and green parts, 1/2 cup of the cilantro, red pepper flakes (if using) and garlic. Cook, stirring constantly, for 1-2 minutes until fragrant. Add the tomatoes, coconut milk and salt to taste (I used about 1 teaspoon). Bring the mixture to a simmer and cook for 10-15 minutes to help develop the flavors and reduce the sauce just slightly. Add the shrimp and cook for 4-5 minutes until the shrimp are pink and tender (overcooking the shrimp will make them tough so keep a close eye on the mixture). Stir in the lime juice. Serve immediately over hot, cooked rice garnishing with the remaining cilantro. This makes a soupier-type mixture so deep plates or bowls would be best for serving. Try more male fertility recipes!